Manohar Notani is an engineer by qualification, but over time, realized that engineering was not his cup of tea. He says 'This realization of being a fourth idiot came somewhat late'. He is now happy in the world of words and we are lucky to have his skills as a Hindi translator. His transaltion of MIss Bandicota Bengalensis Digs up the Seashore won the Hindi book of the Year award at FICCI. Q: What is your personal relationship to language and translation? A: It should be, and should sound ‘natural’. I don’t like to treat language as a mere means of communication. Language is an independent entity itself. Hence, my utmost endeavor is to ingest the concept(s), thought(s) presented in the ‘original’ and then present them in ‘my’ language as if they were never alien to it. Q: When you’ve been given a story to translate, what’s your process, and how long does it generally take? A: It all depends on the fluidity and cogency of the original. If the given story has a natural spontaneity and mirth in it, that ‘wow’ element will follow easily and naturally in my translation too. Otherwise, I have to have 3-4 reading and re-reading sessions prior to translating it. In short, I need to imbibe the original story in its content and spirit. 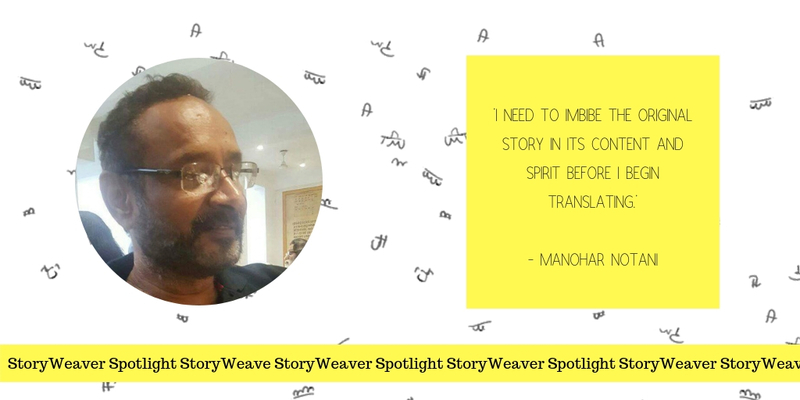 Q: What do stories in translation bring to young readers? A: Pure pleasure, at least, if nothing else. Q: How did you cultivate the skills needed to translate books for children? A: Keeping alive and kicking my child within, through perseverance though. Q: You’ve translated many stories for us. Which has been your favourite to work on? A: Miss Bandicota Bengalensis Digs Up the Seashore , of course. Q: What is the hardest thing about translating from English into Hindi? How do you navigate words or phrases that are tricky to translate? A: Read, read, and read a lot. One has to have a rich ‘working’ vocabulary. Moreover, I invest a lot in books, dictionaries, subscribing to online dictionaries etc. Q: Tell us something about how did you go about translating 'Miss Bandicota'? And how do you feel about the outcome? A: To translate a story of Miss Bandicota’ s caliber, one needs to have the ‘feel’ of its milieu and throw one’s imagination to childlike tantrums. Q: How do you feel when your story reaches the child? A: It’s a sheer, yet indefinable pleasure. Q: How else do you think we can join hands to take more stories to more children in more languages. A: By having a strong faith in storytelling as a strong device for making our universe a better habitat. Q: What type of person do you think makes the best translator for children’s stories? A: One who has a knack for nonsense. Q: Do you have any advice for anyone interested in becoming a translator? A: Be a perpetual yet an untiring learner. Q: A book you'd like to recommend to other translators? A: The God of Small Things and White Tiger.